The dedication and renaming of a city street is just one of the highlights of the second annual Martin Luther King Jr. Day of Service and Learning, Jan. 15-23. “Events throughout the week will focus on the MLK Jr. way of emphasizing issues of justice, pacifism, Christian faith, activism and service, and relationship building,” said Brian Martin Burkholder, campus pastor at Eastern Mennonite University. EMU President Loren Swartzendruber will join with area leaders in the renaming and dedication of Martin Luther King Jr. Way, formerly Cantrell Avenue, on Monday, Jan. 20, at noon. Additional programs include presentations by Mark Metzler Sawin, professor of history, and David Evans, professor of history and mission at Eastern Mennonite Seminary, discussion forums and many community gatherings. All events are free and open to the public. Those interested in attending should meet at the event location. In what ways was the Dr. Martin Luther King Jr. formative or influential in the lives of local people? What is the impact of MLK Jr. in today’s society? For what reasons was it important for Harrisonburg to rename a significant street the Martin Luther King Jr. Way? Come hear first-person narratives from local persons who have been shaped by MLK, Jr.
Stan Maclin, director of the Harriott Tubman Cultural Center, and Titus Bender, professor emeritus, will be the panelists. Location: Lehman Auditorium on the campus of EMU. March through the JMU campus and speak out about King’s life and legacy. This year’s theme is “His courage will not skip this generation.” Sponsored by the JMU Center for Multicultural Student Services. Location: Starts at the James Madison statue near Varner House and ends at Transitions, Warren Hall. 10-10:30 a.m. EMU University Chapel: “Take the First Step in Faith: A History of Inclusion” by Mark Metzler Sawin, PhD. Choose to sit at one of the round tables with a mixture of people from the campus and community for guided conversation related to EMU’s racial heritage as presented in chapel. Meal passes available for participating community members and for students without a meal plan. Coordinated by Beth Lehman, PhD, and Kathy Evans, PhD, professors in the EMU education department. Location: Northlawn cafeteria on the campus of EMU. View a map and directions to Northlawn Residence Hall – Dining Hall located in lower level; view available visitors’ parking by clicking display option on lower left. – Immanuel Mennonite Church at 9:15 a.m. Buses depart from EMU University Commons parking lot at 10 a.m.
– John Wesley United Methodist Church at 11 a.m. Buses depart from EMU University Commons parking lot at 10:30 a.m.
– Bethel African Methodist Episcopal Church at 11 a.m. Buses depart EMU University Commons parking lot at 10:30 a.m.
– Church of God of Prophecy at 12:30 p.m. Buses depart EMU University Commons parking lot at noon. Join the Harrisonburg and Rockingham Chapter of the NAACP for its annual Dr. Martin Luther King Jr. community program with guest speaker Pastor Warne Dawkins from Shiloh Baptist Church in Waynesboro, Va. Music by the Martin Luther King Jr. Coalition Choir. Freewill offering benefiting The Salvation Army shelter. Transportation is provided. Buses will depart EMU University Commons parking lot at 2:30 p.m., and return at 5 p.m. The Sigma Gamma Omega Chapter of Alpha Kappa Alpha Sorority Inc. hosts “Back to Basics: Managing a Household Budget.” Continental breakfast provided. Donations accepted. 10-10:40 a.m. MLK Jr. Day Chapel: “A Domesticated King” by David Evans, PhD. An after-chapel discussion forum will follow. President Swartzendruber is one of the speakers at this event hosted by the City of Harrisonburg. Transportation is provided. Buses depart from EMU library circle at 11:30 a.m., and return at 1:30 p.m., for those who do not want to stay for the ribbon cutting and unity march. They will also return to pick up those who do wish to stay for ribbon cutting and march. 1:30 p.m. Ribbon-cutting ceremony by Harrisonburg City Council followed by a unity march from Memorial Hall to Main Street and back to Memorial Hall. Hot chocolate and rest available at the RISE Ministry House. 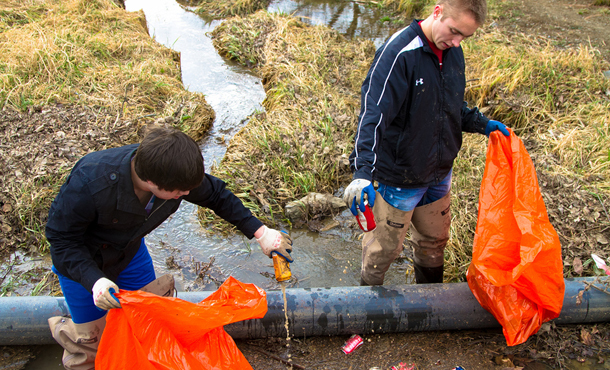 Join the EMU biology and chemistry departments and Earthkeepers club to clean up a stretch of Black’s Run that flows through the northeast neighborhood. Gloves and bags will be provided. Location: Meet at the Science Center at 2:45 p.m. for carpooling or anytime just outside The Little Grill restaurant at 621 N. Main Street, Harrisonburg. Dr. Steve Perry is the 2014 Martin Luther King Jr. formal program speaker. Featured in CNN’s “Black in America” series, Perry is the founder and principal of Capital Preparatory Magnet School in Hartford, Conn. Capital Prep has sent 100 percent of its predominantly low-income, minority, first generation high-school graduates to four-year colleges every year since its first class graduated in 2006. Sponsored by the JMU Center for Multicultural Student Services. Engage with black community leaders, barbers and each other for lively dialogue around issues, dynamics and opportunities related to the MLK, Jr. Way at Tyrone Sprague’s downtown barbershop (6th floor of 2 South Main Street) and at the historic Blakey barbershop in the northeast neighborhood (230 Community Street). You can get a haircut too! Hosts: Stan Maclin of the Harriet Tubman Cultural Center and Jered Lyons, EMU multicultural student advisor. Coordinated by Amy Knorr, practice coordinator for the Center for Justice & Peacebuilding at EMU. Location: Common Grounds Coffeehouse on the first floor of EMU’s University Commons. Admission to all programs is free. For more information on activities related to MLK observances, or for a full schedule of events, visit the MLK Day of Service and Learning website or call campus ministries at 540-432-4115.